Sumitomo Electric Industries, Ltd. (SEI), incorporated in 1897,is a Sumitomo Group company which is carrying on the Sumitomo Business Spirit cultivated through 400 Years. SEI undertakes operations on global scale in five main areas : automotive,information & communication ; electronics ; electric wire and cable, energy, industrial materials. Through its provision of products and services responding to the demands of customers and all society, SEI aims to be an excellent company recognized and solidly trusted by the global community. Sumitomo Fusion Splicer Z2C’s 5 inch LCD monitor with touch screen operation allows to confirm fiber images quickly.Fiber optic splicing machine can be operated by touching the icons on the screen. Ribbon fusion splicer/splicing machine is a compact and portable design and makes a highly accurate and reliable fusion splice in high speed. A touch screen is available on 4.1 inch TFT color LCD monitor. High Definition Core Aligning fiber optic splicing machine-82C’s 5 inch LCD monitor with touch screen operation enables to confirm fiber images easily. The Sumitomo splicer can be operated by touching the icons on the screen. 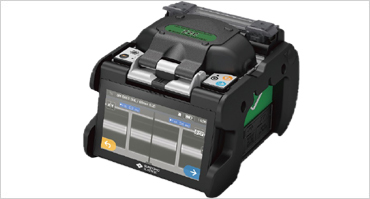 T-400S Active Clad Alignment fusion splicer is compact design and unique technology helps to handle all types of fiber cable used in FTTH like Drop Cable, 2-3mm Cord or 900/250um buffer fiber.